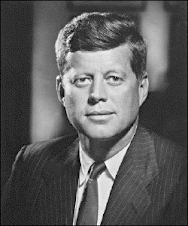 Justice For Kennedy: Everybody needs to stop thinking there are only 1,000 plus CIA documents being kept from us. The number is much larger than that, and the CIA is not the only one withholding stuff. Okay, folks you know I paid attention to the ARRB and to documents released by them. If you don't you should. I am currently going through all the documents as they were listed in the Federal Register, collecting their RIF number, agency of origin, and status. I want to point out one particular item for you. But, first let me give you some context. The ARRB had to list on a document by document basis whether or not they were going to release a document. They had three choices, Open in Full, Release with redactions, ( this was called Postponed in Part, meaning there were some things blacked out but you got a document with some information on it ) or Postponed in Full meaning you don't get to see anything until 2017. Now, the listings have to be analyzed against each other, and not seen as accumulative. What was listed as Open in Full, Postponed in Part, and Postponed in Full may change their status in the next "Notice of Determinations." So, this takes some time. Its similar to a jobs report, you don't take the number of unemployed for every month and come up with a total number of unemployed for the whole year. That's the wrong way to do it. It's not, okay Jan was 5, Feb was 6, March was 9 and you add those up and get 20. You folks know what I mean. 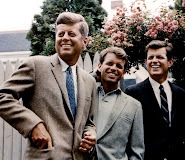 That being said, in April of 1998, due to the very large volume of records they were now processing and the fact that they are going out of business that year, and the considerable cost to them to have to publish their decisions on a document by document basis they stopped doing this. And instead they published a summary giving the agency or source of the document and the total number of postponements. I believe they had a printout for every Notice of Determinations that you could get from them, and I think I have them all somewhere. I'm working on one from April of 1998 at the moment. So, from The Federal Register Vol. 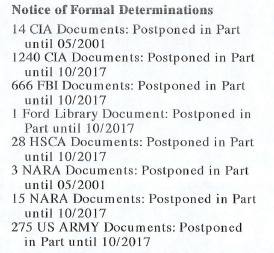 63, No 67, Wednesday, April 8, 1998 page 17151 there is this summary, and as you can see there's more than 1,000 plus CIA documents right there being postponed. I am hoping to have a thorough listing of everything postponed to 2017 by agency and giving the RIF numbers. In the end this will be a long list and covering agencies you folks don't usually associate with this case. I'm doing this in Microsoft Word and it will probably be too large to post on this blog but when I'm done I'll make this available to all. My methodology will be like this, 6 columns, the RIF #, the agency file #, whether its Postponed in Part, or Postponed in Full, and MFF, for whether or not its available on the Mary Ferrell site, and last but not least how many pages each document is. 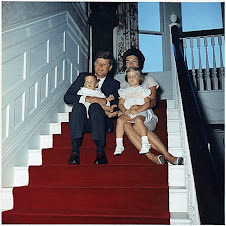 Once we all have this detailed information it will help give credibility to the "Open the JFK Records," chant because we'll be able to show exactly what is still being withheld. 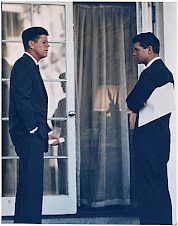 This may impress some media types to say, "Those JFK buffs are right, the government is still withholding a hell of a lot."